All transactions are safe and secure with a reliable history in online purchasing behind each of our associates. 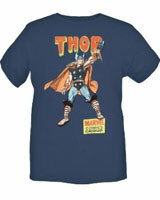 Buy the Thor Core t-shirt to own Thor clothing and merchandise. While most Thor apparel today features more modern interpretations of the hero, this one offers a vintage eighties style take on the man who protects the people of Earth on a daily basis. When he's not in hero mode, he works as a doctor and spends time with his love Jane Foster. He also enjoys watching thunderstorms. Perhaps you both have that in common. If so, snag this Marvel tee to wear as you listen to the rumbling of a storm or the Thor soundtrack from the movie starring Chris Hemsworth and Natalie Portman. In addition to the Thor Core tee above, browse the Thor Clothing Gallery for more apparel like men's and women's clothes, kids shirts or hoodies.